Parkinson's Weighted Kit- Standard- are the most recommended ADL (Activities for Daily Living) products for persons with Parkinson's Disease (PD) and other illnesses causing tremors or shaking. Aids to daily living help patients or loved ones to enjoy more freedom through independence. 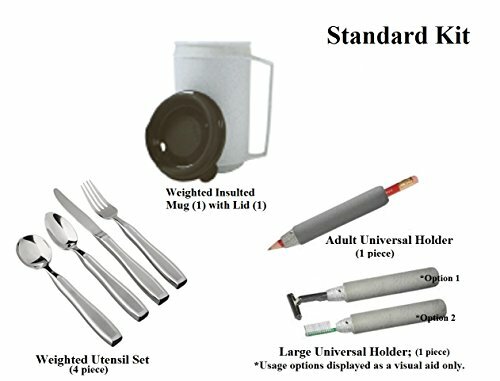 Kit Includes: KEatlery Weighted Utensil Set (4 piece), Weighted Insulated 12 oz. Mug (1 piece), Universal Holder- Large (1 piece), Universal Holder- Adult (1 piece) Universal holders can be used for writing utensils, razors, toothbrushes or any like sized item that needs a better grip. Weighted items have steel weight added internally to the base to reduce tremors of the hand. Because of the internal steel ** DO NOT MICROWAVE the WEIGHTED ITEMS ** Top rack dishwasher safe only. 38000 Kit also available in Deluxe. Aids to daily living help patients or loved ones to enjoy more freedom through independence. Universal holders can be used for writing utensils, razors, toothbrushes or any like sized item that needs a better grip. Top rack dishwasher safe only. If you have any questions about this product by Millennial Medical, contact us by completing and submitting the form below. If you are looking for a specif part number, please include it with your message.